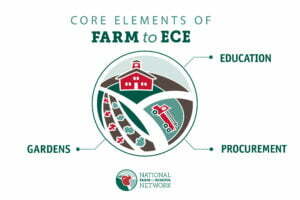 The NC Farm to Preschool Network connects, educates, develops and shares resources between community and state partners, farmers, early childhood educators and families to spark the local foods movement in early childhood education environments. Farm to preschool includes any type of child care that includes local foods through one or more of the following: meals and snacks, taste tests, lessons, farmer visits, cooking, growing food, and/or community and parent involvement. We hope you’ll find helpful farm to preschool resources on this website (as part of ASAP’s Growing Minds program), through the National Farm to School Network’s website (search by Preschool/Early Care setting) and via our Network Facebook page. Since many partners across NC help support farm to preschool and ECE in our state, we are happy to link you to other great resources as well. We are busy gathering resources to support farm to preschool in ECE settings across NC, having annual planning meetings of our Advisory Committee, and establishing our website presence under ASAP (one of the founding partners). For more information about these resources or for more information about the North Carolina Farm to Preschool Network, please contact Kim Knoppel, kim@nullasapconnections.org, 828-236-1282 ext. 103.